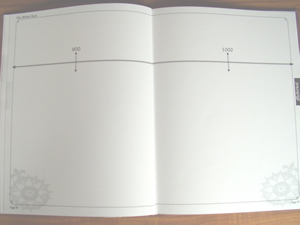 Here is a sample of the blank timeline pages in our Wonders of Old book. The book may be written in, drawn in or used with one of the products listed below. 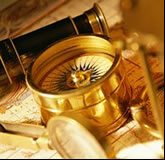 This is a sample of the Wonders of Old timeline book using History Through the Ages timeline figures. The figures have a beautiful illustration along with a caption giving information about the person or event that it illustrates. Figures may be colored by the student, or left black and white. A glue stick works best for affixing the figures to the book. 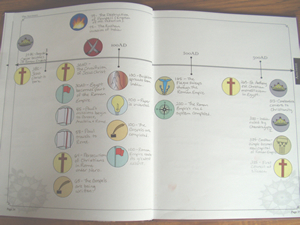 This is an example of the timeline book using our Timeline Category Stickers. The student must write in their entries and can then "categorize" their entries with colorful stickers. WOW! I don't know how else to type my reaction to this new product from Knowledge Quest. This is a beautiful, beautiful, book. It is one of those rare books that not only looks good, it feels good in your hands. An oversize, hardbound volume, the cover is a work of art in itself. I really believe the care and love that have gone into the production of this book will inspire it's young owners to cherish and respect it and its contents. This is a book you will see on a shelf at a convention and instantly want to pick up. Terri has made a timeline journal that I predict will be one of the few things that remain permanently after the years of schooling are over. This is going to become like a school scrapbook of history in our home and it will grow easily from year to year with my son. My four-year-old daughter is already asking when she can have her own copy! The pages are large and smooth with the timeline written across the middle of each page. Lots of room above and below for adding stickers, pictures, notes, and 'personality'! Because it is hard bound I guess we will want to use mainly flat objects inside it, but Terri has produced a great timeline on CD-ROM for those of you who really scrapbook with your timelines! The CD is also perfect for those families with many children who each want their own book. You can print out as many copies as you like and bind it however you choose. Lots of flexibility and room to adjust. Both the hardbound and the CD are available from the Knowledge Quest web site. I love the hardbound version of this book. It is superior to any binder timeline I have ever seen and it is so sturdy it will survive even my rough and tumble nine year old. My 18 year old daughter looked at it and musingly wished she could have had one like it when she was still at home doing school. Terri has included all kinds of thoughtful extras with this beautiful book. The fonts change from one time division to the next and they really give the 'feel' of the time you are working in. The book is divided into four sections; Ancient(5000BC-400AD), Medieval(400-1600AD), New World(1600-1850AD), and the Modern World(1850-the Present). Each section has from 10 to 20 double page spreads to enter information, and Terri has included tons of possible entries, listed at the back of each division, to spur on the creative process and give lots of options. There was also a neat little coupon inviting me to send in and receive a package of timeline stickers-Free! What a neat little perk within an already gorgeous product. I can't wait to see my son's progression and growth as he uses this book and begins to make connections from one event to another, or discovers something that happened at the same time as an event previously studied-that 'aha!' light that comes on is so evident with a book like this. I know he will soon be making his own connections to the world and to history, as he charts events and people that have impacted him. The very feel of the book will encourage your students to do their best work and make their entries look good. The only thing I can think of that might be a problem is if you are using this book with small children and a mistake is made that needs correcting. You will need to cover the problem with another figure or a sticker or something because the pages are sewn in and can't be replaced as with a timeline in a binder. I find this just motivates my son to do his best possible work and he can then be so proud of what he has done. I know this is going to be the first book that comes off the shelf when the grandparents come to visit-it is the type of book that instills pride....take a look, I know you will agree that this book is truly a keepsake, not just another resource. It is my humble opinion that this treasure belongs on every homeschool family's bookshelf!